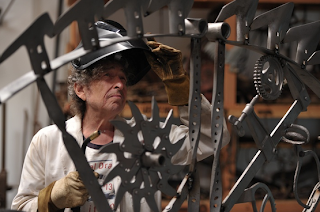 I'd love to see the seven welded gates of Bob Dylan. The gate in the photo above reminds me of the rainbow I saw this afternoon. There was a rainbow yesterday late in the day, too. Very interesting! I didn't know that Dylan created welded art. Neat that these are gates. I have a friend who also welds and has made gates. The last one I saw was a dreamcatcher gate made of salvaged metal objects.